I have fond memories of Vacation Bible School, of days filled with singing songs, playing games, making crafts, eating silly food, and learning more about my faith. 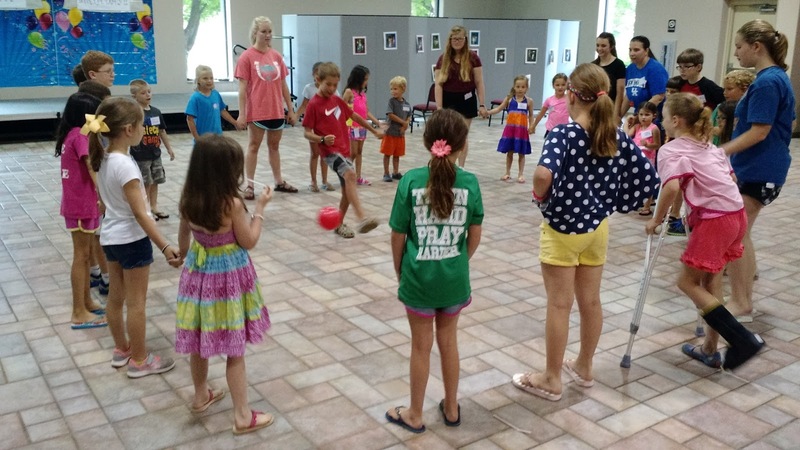 Once I became an adult and began working at the parish where those childhood memories were formed, I couldn’t imagine not making Vacation Bible School a part of our ministry to children. For a great many families, Summer = Vacation Bible School. I think that’s great, but it also got me wondering: What is the origin of Vacation Bible School? Where did it come from and how did it get started? We are currently deep in "VBS Season", so these are questions worth exploring. After doing some research, I discovered that not only does VBS long predate the 1980’s (when I was a kid), it actually has some roots in Kentucky! Vacation Bible School owes its origin to the Sunday schools, tent revivals, and bible institutes of early American Protestantism. All of these eventually required some gathering of children to receive instruction over a prolonged period of time, and VBS organically developed from that. In the early 19th century, the phenomenon of tent revival meetings emerged. A large tent would be erected, and a traveling preacher would come and give rousing sermons over a span of many days. This strategy for reviving churches and bringing people to Jesus quickly spread throughout the country. Since these gatherings were primarily for adults, it was the practice in some places for the children to receive special instruction before the big event in the evening. In 1874, inventor Lewis Miller and Methodist Episcopal bishop John H. Vincent founded the Chautauqua Institution, a teaching camp for Sunday School teachers. Soon after, programs for children and families were established, and this model was copied in “Chautauquas” all over the country. The flame died out after World War II, but the original Institution on Chautauqua Lake in New York exists to this day. In 1898, Mrs. Walker Aylette Hawes established her “Everyday Bible School” to minister to the immigrant children who spent their summer days running the streets of New York City’s East Side. She rented a beer parlor that was not used during the day, and for six weeks she gathered the neighborhood children together for worship music, Bible stories, Scripture memorization, games, crafts, drawing, cooking, etc. By 1910, the Baptist and Presbyterian Churches had really taken up the banner of Vacation Bible School, formalizing the process and method of instruction and publishing their own VBS textbooks. Two of the earliest and largest publishers of VBS materials – LifeWay and Standad Publishing (now Christian Standard Media) – grew out of these early efforts. As a Kentuckian, I was excited to find some slight connections to the birth of VBS in my home state. For example, if we consider tent revivals as providing an impetus for a type of week-long instruction for children during the Summer months, it's worth noting that many historians trace the origin of tent revivals to Kentucky and the Appalachian territories. One of the earliest, if not the first, took place in July of 1800 when Rev. James McCready held a camp meeting at Gasper River Church, near Bowling Green, KY.
Also, remember Mrs. Hawes? Her “Everyday Bible School” provided a form of instruction similar to VBS as we know it today. Well, she was a sister-in-law of John A. Broadus, a founder and later president of The Southern Baptist Theological Seminary in Louisville, Kentucky. There's no doubt that her Baptist missionary and evangelistic zeal is what prompted the effort to found a bible school for children. Most Protestant and Catholic churches have VBS programs, or they combine their efforts with the churches that do. These programs are usually scheduled at different dates throughout June and July. In fact, if you plan it right, your child won’t have a week of Summer unoccupied! VBS is typically either in the morning, to give the kids a great way to start each day, or in the evening so that the parents who work during the day can also attend. It's best suited for children entering grades K-5, but age ranges can vary. 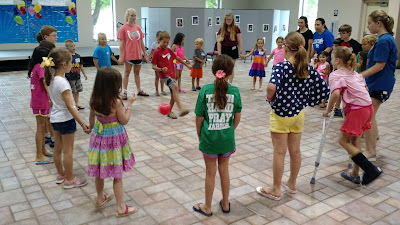 Many churches also provide daycare during VBS so that children who are too young for VBS can still come and participate in activities at their level. The typical program is made up of several stations that the children will cycle through during the event. These can include: Faith Station, Music Station, Fun & Games Station, Arts and Crafts Station, and Snack Station. There is also typically an Opening Assembly, when skits are performed and the themes of the day are introduced, and a Closing Assembly where the themes of the day are reviewed and any parting gifts are distributed. As "Whole Community Catechesis" has caught on, some churches provide separate educational experiences for parents and adults while the kids are engaged in VBS, or they structure their VBS program in such a way that the parents and the children are participating together. As you can see, there are a lot of ways to structure it, according to the needs of your church or parish. It’s easy to see why this has become so popular. Vacation Bible School is reasonably priced (free at some churches), it’s a lot of fun for the kids, and it even provides a little break for the parents -- unless you decide to rope them in too! It has been going strong in this country for over 110 years, and shows no signs of slowing down. When and Where Did Vacation Bible School First Begin? The History of VBS. American Christianity.